A general definition of periglacial environments refers to conditions where frost action and permafrost-related processes dominate the physical environment. Common to all periglacial environments are cycles of freezing and thawing of the ground and the presence of permafrost, or perennially frozen ground. Presently, these environments primarily occur at high latitudes in the Arctic and Antarctic and at high elevations in mountainous areas at midlatitudes. About 25% of the Earth's land surface currently experiences periglacial conditions. Certain geological processes and landforms are unique to the periglacial environment. These include the formation of permafrost and wedge and injection ice, development of thermal contraction cracks, and the formation of thermokarst or subsidence features due to thawing of permafrost. Other processes, such as frost heaving, soil creep, solifluction, and wind action processes acting on barren soils, are also important in the periglacial environment. Recognizing and interpreting fossil periglacial phenomena is an integrated part of reconstructing Quaternary climate development. Fossil periglacial phenomena commonly occur at midlatitudes in Eurasia and North America: areas that experienced periglacial conditions during cold spells of the Pleistocene but which today have temperate climates. Pleistocene periglacial conditions were not restricted to midlatitude locations. Extensive areas in the central and eastern Siberian Arctic as well as parts of the Beringian area and northwestern Canadian Arctic remained icefree through long periods in the Pleistocene and were subject to intensive periglacial activity. A number of phenomena are indicative of frozen ground and intense frost action, and can be used for paleoclimate reconstructions. These include frost fissures; blockfields, screes, and rock glaciers; frost creep and frost-disturbed deposits; tors; fossil permafrost; massive ground ice; and aeolian sediments and ventifacts. Frost fissures are wedge-shaped structures interpreted to be casts of thermal contraction cracks. Since the development of frost fissures only occurs under permafrost conditions and intense cooling (-15°C to —20°C), these are first-order indicators of periglacial environments. Fossil frost fissures, in the form of frost fissure polygons and ice and sand wedge casts, have been described from extensive areas in northern and central Europe and North America, and have been mapped to provide evidence on the distribution of Pleistocene permafrost. Blockfields, screes, and rock glaciers indicate frost action and weathering. Extensive accumulations of angular boulders blanketing mountain plateaux and talus scree accumulations along mountain slopes are thought to have formed primarily by frost wedging and cracking of bedrock. In Europe, North America, and Asia, blockfields talus and frost-shattered debris occur on uplands and mountains outside the present-day distribution of permafrost, and are taken to indicate occurrences of Pleistocene permafrost. Rock glaciers form in the periglacial zone of mountains, and are unique permafrost landforms. They are often fed by taluses formed upslope by frost shattering of bedrock. Relict (inactive) rock glaciers, occurring below the periglacial zone or below the treeline, have been reported from many mountainous areas in the world. In the Alps, many of these turned inactive by the end of the Pleistocene. In permafrost areas with frequent freeze-thaw cycles, frost heaving of the surface layers can lead to downslope movement of the material by frost creep. This is a process that was probably more active at midatitudes than high latitudes during the Pleistocene, since midlatitudes experienced more freeze-thaw cycles than colder Arctic environments. Frost-disturbed deposits, or cryoturbated deposits as they are also referred to, very frequently occur in Pleistocene soils at both high- and midlatitude sites. They form by repeated frost heaving and disturbance in the active layer, as well as by gravity loading and water saturation in connection with thermokarst degradation. Hillslope and summit tors (rocky crags) commonly occur in both high- and midlatitude uplands and mountain areas. Tors are frequent in the alpine landscapes today, for example, in western Spitsbergen, occurring on mountain ridges and arêtes between glaciated cirques and valleys. Their formation has been attributed to intense frost shattering at nonglaciated sites, although an alternative explanation for some tors suggests that they are mainly the result of chemical weathering and thus are not indicative of frost action. Much of the thick permafrost in Siberia is in disequilibrium with the present climate and is largely a relict (i.e., fossil permafrost) of Pleistocene climate conditions. The present occurrence of subsea continental shelf permafrost in the Arctic Ocean, developed during periods of low global sea levels during the last glacial maximum, illustrates the preservation of relict permafrost. The history of permafrost in the Russian Arctic has been traced some 2-1.5 million years back in time, and it is presumed that much of it might have started to form in the Middle Pleistocene. Thick bodies of massive ground ice have been described from northern Alaska, the western Canadian Arctic, China, and western Siberia. 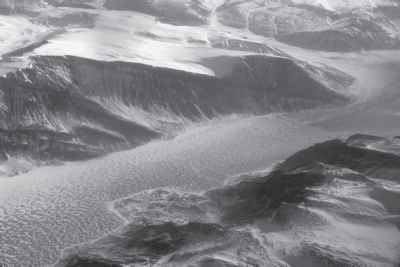 A favored origin is that most bodies of massive ground ice formed through ice segregation and injection processes, where excess pore water froze within the sediments. An alternative explanation is that massive ground ice is buried glacier ice and remnants of Pleistocene ice sheets. Other theories explaining the genesis of massive ground ice include buried lake, river or sea ice, and buried snow bank ice. It has been pointed out that massive ground ice in the Arctic primarily occurs within the limits of formerly glaciated areas. One explanation for this relationship is that most of these ice bodies might be relict glacier ice. It has long been recognized that wind action was particularly intense in the Pleistocene periglacial environment. Huge, nonvegetated outwash plains dried out during late summer and fall, and strong winds generated extensive dust clouds. Aeolian sediments such as sand dunes, cover sands, and loess deposits, which occur in belts outside formerly glaciated areas, mainly at midlatitudes, are the geological products of the periglacial wind action. Pleistocene ventifacts—or stones facetted by dust-laden wind abrasion—are very common in midlatitude regions of Europe and North America, and have been used to infer prevailing wind directions at the time of their deposition/abrasion. The interpretation of fossil periglacial phenomena is not always straightforward, and some structures, sediments, and forms may develop under non-periglacial conditions as well. As the understanding of the present periglacial environment increases, there will be an improved understanding of how fossil periglacial phenomena relate to and provide an insight into climates of the past.